As you may already know we’ve been riding the Fezzari Wiki Peak. 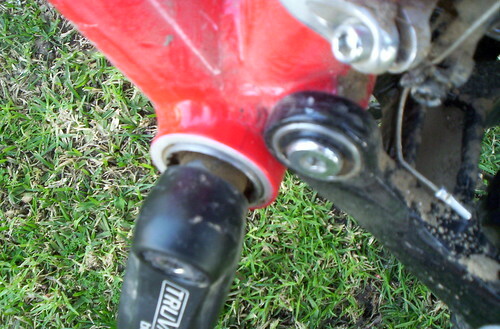 Well sad to say that I was a bit rough on her and I cracked the bottom bracket. It wasn’t anything serious, just a hairline fracture that started from the outer part of the BB and traveled to the weld. 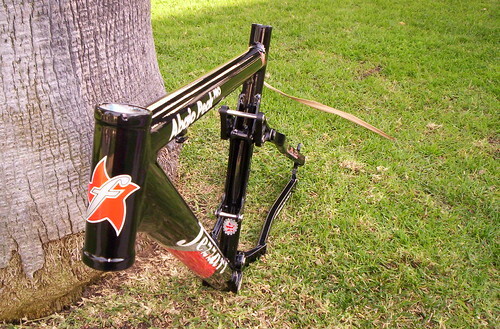 So I emailed Chris of Fezzari and gave him some pics of the bike. He was actually pretty cool about it. I thought that they would have given me a hard time since I did take the Wiki Peak on a 5 footer drop. But he was actually puzzled that something like this would have happend. After a few more emails Chris went ahead and sent me a replacement frame. However, he didn’t send me just a regualr Wiki Peak, but he actually sent me the Abajo Peak! Ain’t she a beaut! Though it looks the same as the Wiki Peak, its still an Abajo in my book! I’ve already started taking apart the Wiki Peak and within a few days I should have the Abajo Peak up and running. 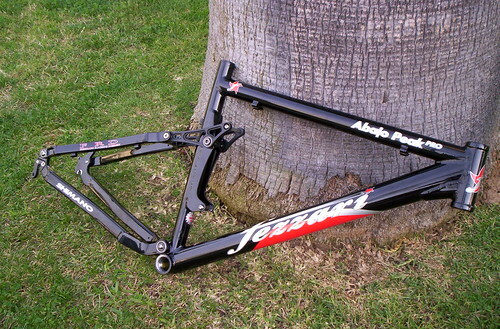 What a stand-up company Fezzari is to replace the frame like that. We really do test the bikes hard, in real life conditions. It’s good to know they stand behind their product. Kudo’s and thanks to Fezzari. We make sure that all the products we test go through the same tough stuff that consumers would do to their own. I am really impressed with Fezzari’s heart behind their product.